It was a bit of a special weekend in Brisbane, and it’s been pure coincidence that I ended up here while so much was going on. Ok, I say pure coincidence, at least it was a week ago when I found out and then made my arrangements to be here. 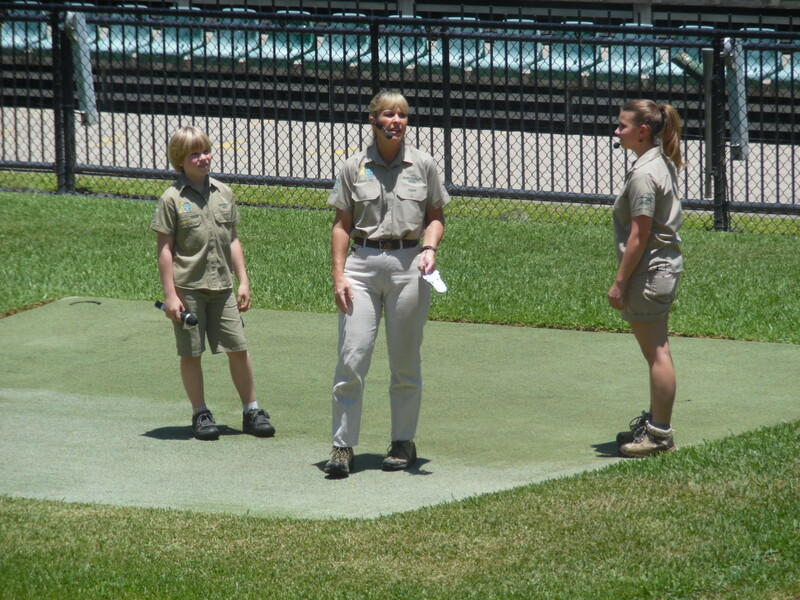 Not that I was bothered about world leaders gathering for the G20 summit (more about that later), I just wanted to make sure I went to Australia Zoo on International Steve Irwin day. Every year on 15th November, although I have no idea why this day in particular, Australia Zoo celebrates the life of Crocodile Hunter Steve Irwin even more than it already does, with special events and stalls designed to raise money and awareness for the Wildlife Warriors campaign. I myself am currently sporting a special limited edition green “Crikey” wrist band to show my support. Face painting and caricatures aside, for me the real bonus was seeing the world-famous crocodile show being performed by none other than the Irwin family themselves, Terri, Bindi, and Robert, along with best mate Wes. I should also point out that just prior to the show, Steve Irwin day at the zoo was in fact officially opened by John Edward, friend of Steve’s, and psychic medium. Despite being as close to Steve as he could get both spiritually (on stage with his loved ones) and physically (Steve is buried in a private part of the zoo), he somewhat sensibly didn’t try to send Steve himself an invitation. I was working in WHSmiths when Steve Irwin was killed, and as a fan of his series I spent the day reading the headlines and stories of the newspapers with as much interest as sadness. One particular quote I remember, which sums up not just Steve but his relationship with those he was close to, was from a friend who said something along the lines of “well he wasn’t going to die in his sleep, was he.” Certainly can’t argue with that, and it was for that passion and, somewhat ironically his lust for life, that I admired him. His death was about the last I heard of the Irwins, and as much as Terri was often seen with Steve in his TV shows, I knew hardly anything about Bindi and Robert, and was interested to see how much they had followed in their father’s footsteps. Something which as it turns out, is rather a lot. Their names and images are plastered about the Zoo, and alongside their own book, DVD, and clothes ranges (Terri also has her own brand of Terri’s Cougar Wear 😉 ), it is obvious they have been brought up being no strangers to the spotlight; they were both as equally at ease with the audience of the Crocoseum as they were with the crocodiles inside it. The last time I saw Robert was when Steve received much criticism for feeding a crocodile with his then one month old son in his arms. 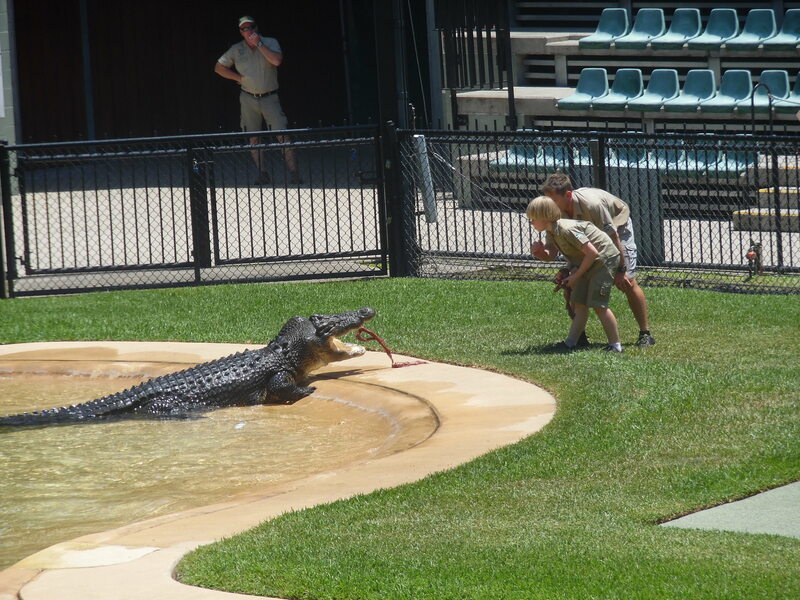 This weekend I saw that same child now just shy of his 11th Birthday in the very same arena feeding that very same crocodile. A big salt water (estuarine) crocodile called Monty. Although best mate Wes kept a tight grip on the back of his shirt, it was obvious that Robert knew what he was doing, likewise with Bindi feeding him from the small balcony set up to display his great leaping ability. The main attractions though (ie. The even more really dangerous stuff), including jumping in the water to illustrate the death roll and enticing Monty back to his cage, was left to Wes. Behind the jokes and the daredevil acts though, there was a serious side to the display, namely showing just how dangerous these beasts can be. It is amazing how still the water appears when they’re gliding through it, and how quickly they can snap out of it on to the shoreline. It all leaves you with a feeling of wonder as to why people would risk getting anywhere near them in the wild. 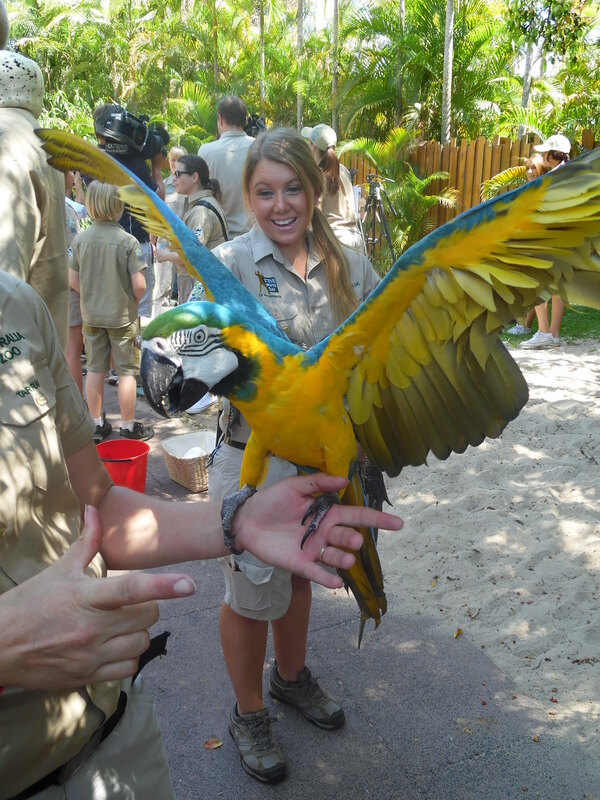 The more active animals were definitely on display. As for the rest of the Zoo itself, it’s smaller than you might imagine considering it’s reputation, but no less impressive for it. Unfortunately on a day which gets even Australians complaining about the heat, it seems that the favourite activity of several animals is to hide way in the shade, which isn’t so impressive but you can hardly blame them. I caught only a quick glimpse of a Tasmanian devil, but luckily there were a fair amount of zoo keepers parading animals for all the guests to enjoy, and to be distracted by when the Irwin’s are out in the zoo itself. Not that it worked the whole time, and all credit to Bindi, she hardly seemed fazed when people started shouting for a wave. It is hardly surprising that on a day when it wasn’t just the children playing in the sprinklers, the Africa enclosure was perhaps the most active. They weren’t moving a great deal, but at least the giraffes and zebras were standing up, which is more than I can say for some others. Most active aside from the tigers at least, who also had their own show, and happily played with a zoo keeper whilst her colleague told us all about them and the sheer drastic levels of how endangered they are. They really are just big cats. And that’s what Steve Irwin day is all about. It’s about the things that he himself was passionate about, not just saving wildlife and saving species from extinction, but educating others so that they can join in the fight as well. It was the statistic that there are 1,500 less tigers in the wild than seats in the crocoseum that really surprises the most, and leaves most experts wondering if there will actually be any tigers left in the wild at all by 2020. 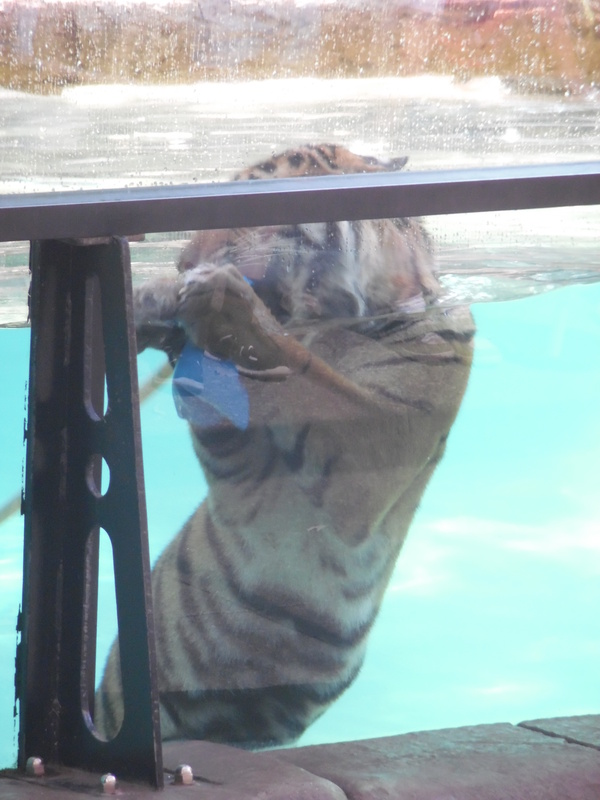 And then whilst swimming in his pool, Clarence the Sumatran tiger did a big poo right in front of the glass for everyone to laugh at. He obviously knows how to entertain an audience as well.